Dong Ho folk paintings recognized as National Intangible Cultural Heritage. The Ministry of Culture, Sports and Tourism has listed Dong Ho folk paintings as a National Intangible Cultural Heritage. 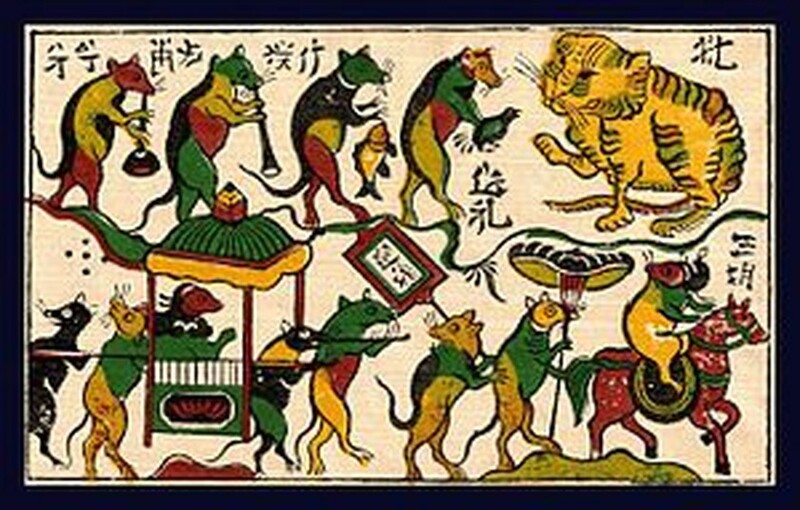 Dong Ho painting (Tranh Đông Hồ or Tranh làng Hồ), full name Dong Ho folk woodcut painting (Tranh khắc gỗ dân gian Đông Hồ) is a genre of Vietnamese woodcut paintings originated from Dong Ho village (làng Đông Hồ) in Bac Ninh Province, Vietnam. Using the traditional điệp paper and colours derived from nature, craftsmen print Dong Ho pictures of different themes from good luck wishes, historical figures to everyday activities and folk allegories. In the past, Dong Ho paintings were an essential decoration during Tet. The art, which dates back to the 11th century during the reign of the Ly dynasty, has long been considered a symbol of the traditional culture of Viet Nam. In the past, Dong Ho painting was an essential element of the Tết holiday in Vietnam; this tradition has gradually declined under the influence of modern types of painting and fake Dong Ho products. The art of making Dong Ho pictures is always considered a symbol of traditional culture and aesthetic value of Vietnam. Today, most local people have taken up more profitable jobs. The number of artisans who still pursue the traditional art can be counted on the fingers of one hand.